In order to keep up with modern computing environments, today’s tech companies must constantly reevaluate their data storage methods. After all, a server’s RAM — while useful for storing data — is typically finite, volatile, non-shareable and comparatively expensive. This is where a cache becomes crucial; in order to reduce the time needed to access data stored outside of an application’s main memory space, companies should consider employing an application cache. An application-side cache reduces the number of resource demands required to serve data from external sources, thereby freeing up these resources for other purposes. This, in turn, can maintain an application’s high availability, because a cache can serve data to the application even during outages and maintain the application’s speed and performance. A cache typically stores data that needs to be quickly accessed, such as configuration settings or session data, so the use of a cache is vital to meet today’s data processing standards. There are a few different types of application caches: private on-heap caches, shared off-heap caches and distributed shared cache. A private cache can only be accessed by the process that owns it, while a shared off-heap cache offers looser coupling between the application and its cache’s resource requirements. However, Redis falls under the third category; it functions as a distributed shared cache, which means that it enables true statelessness for a given application’s processes, minimizes the duplication of cached data and scales back requests to external data sources. Please download our ebook to learn more about different application cache types and what each cache is traditionally responsible for storing. Redis is an open source, in-memory data structure store that can be used as a database, a caching layer or a message broker. Redis can handle a complex range of use cases, in industries ranging from ecommerce to fraud detection, and is simultaneously flexible and efficient, ensuring increased throughput and lower latencies. As a result, caching is one of Redis’ most popular use cases. Not only is Redis optimized for speed and highly available, but also it supports arbitrary data and multi-key operations. Redis also supports a configurable eviction policy, enables intelligent caching — that is, the caching of more advanced data — and offers optional and tunable data persistence mechanisms. Redis is the most popular distributed caching engine today, with its sizable host of capabilities and the additional resources offered by Redis Enterprise Cloud and Redis Enterprise. 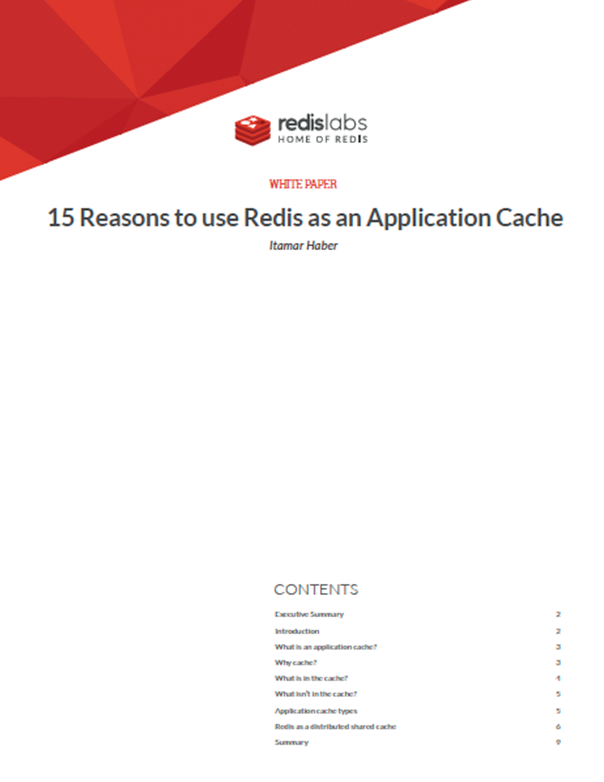 For a full list of all the ways in which Redis is ideal for application caching, please download our ebook.